The workhorse 110Xi4 was built on the legacy of the Xi series of products. Product Model: 110Xi4. Manufacturer: Zebra Technologies Corporation. Product Type: Direct Thermal/Thermal Transfer Printer. Maximum Mono Print Speed: 355.60 mm/s. Parallel connection. Thermal Transfer. Direct Thermal. We will always go out of our way to source the product you are looking for. Add to Favourites. Bixolon SLP-TX420 Thermal Transfer Label Printer. SLP-TX420D/BEG - Peeler/Serial/Parallel/USB (Dark Grey). Direct thermal / thermal transfer. Up to 178mm per second print speed. Label printing on paper of between 0.06 - 0.20mm thick. Optional Ethernet, Wifi, or Parallel interfaces are als. Manufacturer: Citizen Micro HumanTech. Product Family: CL. Form Factor: Desktop. Product Series: CL. Product Type: Direct Thermal/Thermal Transfer Printer. With a variety of door options, the PD43 can su. Product Model: PD43. Form Factor: Desktop. Product Type: Direct Thermal/Thermal Transfer Printer. Maximum Mono Print Speed: 152 mm/s. Maximum Print Resolution: 300 dpi. Manufacturer: Citizen Micro HumanTech. Product Family: CL. Form Factor: Desktop. Product Series: CL. Product Type: Direct Thermal/Thermal Transfer Printer. Maximum Mono Print Speed: 150 mm/s. High speed. Product Model: ZD620. Product Type: Thermal Transfer Printer. Manufacturer: Zebra Technologies Corporation. Continuous Roll. Maximum Mono Print Speed: 152 mm/s. Maximum Print Resolution: 300 dpi. Maximum Print Width: 108 mm (4.25"). Manufacturer Part Number: 79801M. Product Model: 79801M. Product Type: Printhead. Get the best performance from your Zebra printer by usingQualityZebra supplies are made by Zebra, for Zebra printers, to the highest standards. Product Model: ZT620. Manufacturer: Zebra Technologies Corporation. Product Type: Direct Thermal/Thermal Transfer Printer. Maximum Mono Print Speed: 305 mm/s. Maximum Print Resolution: 300 dpi. Continuous Label. Notes: USB connectionONLY. This is not a network printer. Product Model: ZT610. Manufacturer: Zebra Technologies Corporation. Product Type: Direct Thermal/Thermal Transfer Printer. Maximum Mono Print Speed: 356 mm/s. Die-cut Label. Product Type: Direct Thermal/Thermal Transfe. Product Model: MCP21 LB BK E U. Manufacturer: Star Micronics, Inc. Cutter Life: 2000000 Cuts. Product Type: Thermal Transfer Printer. Maximum Mono Print Speed: 100 mm/s. Maximum Print Resolution: 203 dpi. Bixolon SLP-TX420 Thermal Transfer Label Printer. SLP-TX420DEG/BEG - Peeler/Serial/USB/Ethernet (Dark Grey). Direct thermal / thermal transfer. Up to 178mm per second print speed. Label printing on paper of between 0.06 - 0.20mm thick. Manufacturer Part Number: G48000M. Product Model: G48000M. Product Type: Printhead. Get the best performance from your Zebra printer by usingQualityZebra supplies are made by Zebra, for Zebra printers, to the highest standards. Bluetooth® connectivity allows for fast access to your smartphone or tablet, so you can easily begin printing your first label. Maximum resolution 300 x 300 DPI. Ending Soon. Print technology Thermal transfer. 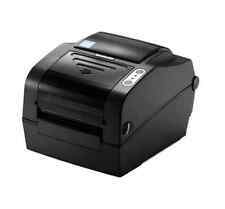 Honeywell PM43c label printer Thermal transfer 203 x 203 DPI Wired & Wireless - PM43CA1150000201. Maximum resolution 203 x 203 DPI. Monitor & TV. Ending Soon. Connectivity technology Wired & Wireless. ZT230 Industrial Printer, TT, ZPL, 300Dpi, RS232, USB, ZebraNet 10/100 Print Server, Cutter – a front-mount guillotine cutter, 128MB Flash. Certification IEC 60950, EN 55022 B, EN 55024, EN 61000-3-2, EN 61000-3-3, cTUVus, CE, FCC-B, ICES-003, VCCI, C-Tick, NOM, S Mark, CCC, GOST-R, KCC, BSMI. Bixolon SLP-TX420 Thermal Transfer Label Printer. SLP-TX420DE/BEG - Peeler/Serial/USB/Ethernet (Light Grey). Direct thermal / thermal transfer. Up to 178mm per second print speed. Label printing on paper of between 0.06 - 0.20mm thick. Product Type: Direct Thermal/Thermal Transfer Printer. Maximum Mono Print Speed: 254 mm/s. Product Family: H-Class. Form Factor: Desktop. Product Type: Direct Thermal/Thermal Transfe. Manufacturer Part Number: C33-00-46400004. The B-EX4T1 series, combine the features and functionality of the established B-SX range with the added benefits of increased performance and operability. Manufacturer: Toshiba. Product Model: B-EX4T1 TS. Bixolon SLP-TX420 Thermal Transfer Label Printer. SLP-TX420EG/BEG - Serial/USB/Ethernet (Dark Grey). Direct thermal / thermal transfer. Up to 178mm per second print speed. Label printing on paper of between 0.06 - 0.20mm thick. Bixolon SLP-TX423 Thermal Transfer Label Printer. SLP-TX423/BEG - Serial/Parallel/USB (Light Grey). Direct thermal / thermal transfer. Up to 178mm per second print speed. Label printing on paper of between 0.06 - 0.20mm thick. Bixolon SLP-TX420 Thermal Transfer Label Printer. SLP-TX420CEG/BEG - Cutter/Serial/USB/Ethernet (Dark Grey). Direct thermal / thermal transfer. Up to 178mm per second print speed. Label printing on paper of between 0.06 - 0.20mm thick. PM43, 300DPI, Ethernet, IEEE 802.11 a/b/g/n, Thermal Transfer, EU cord. Certification RoHS, CE, FCC A, UL/cUL, C-Tick, D Mark, CCC. Ending Soon. Print technology Thermal transfer. And with comprehensive command language support – including ZSim2, our fast, friendly and complete ZPL-II emulation – upgrading to PM series has never been simpler. Form Factor: Desktop. Product Type: Thermal Transfer Printer. Maximum Mono Print Speed: 152.40 mm/s. Product Family: M-Class. Maximum Print Resolution: 203 dpi. Maximum Label Width: 118.11 mm. Manufacturer Part Number: KD2-00-46000S00. Bixolon SLP-TX420 Thermal Transfer Label Printer. SLP-TX420CE/BEG - Cutter/Serial/USB/Ethernet (Light Grey). Direct thermal / thermal transfer. Up to 178mm per second print speed. Label printing on paper of between 0.06 - 0.20mm thick. Product Model: MCP21 LB WT E U. Manufacturer: Star Micronics, Inc. Cutter Life: 2000000 Cuts. Product Type: Thermal Transfer Printer. Maximum Mono Print Speed: 100 mm/s. Energy Star: Yes. Product Line: mC-Print2. Star Micronics TSP743 II, Thermal transfer, 250 mm/sec, 8.25 cm, White, UL, C-UL, TÜV, FCC, VCCI, EN55022, CE, Gost, 147 mm. Star Micronics TSP743 II. Print technology: Thermal transfer, Print speed: 250 mm/sec, Maximum printing width: 8.25 cm. WASP WPL406 USB LABEL THERMAL TRANSFER PRINTER. The WPL406 features multiple connectivity options including Ethernet, USB, and serial interfaces. Model: WPL406. Thermal transfer and direct thermal printing. CL-S621 - Thermal transfer & Direct thermal, 203 dpi. Maximum resolution 203 x 203 DPI. Ending Soon. Print technology Direct thermal / thermal transfer. you can buy in set of 6 max. we do not take any responsibilty after this. Product Model: ZD620. Product Type: Thermal Transfer Printer. Manufacturer: Zebra Technologies Corporation. Continuous Roll. Maximum Mono Print Speed: 203 mm/s. Maximum Print Width: 104 mm (4.09"). Maximum Print Resolution: 203 dpi. ZT230 Industrial Printer, TT, ZPL, 203Dpi, RS232, USB, ZebraNet 10/100 Print Server, 128MB Flash. ZT230 Industrial Printer. The easy tool-less platen and print head removal makes it easy for operators to maintain the printer. Product Model: MCP31 L WT E U. Manufacturer: Star Micronics, Inc. Cutter Life: 2000000 Cuts. Star's built-in WebPRNT and CloudPRNT technology allows for simple connection to local network or cloud based systems. Product Type: Printhead. Get the best performance from your Zebra printer by usingQualityZebra supplies are made by Zebra, for Zebra printers, to the highest standards. Manufacturer: Zebra Technologies Corporation. Product Model: ZD620. Product Type: Thermal Transfer Printer. Manufacturer: Zebra Technologies Corporation. Maximum Mono Print Speed: 152 mm/s. Continuous Roll. Maximum Print Resolution: 300 dpi. Maximum Print Width: 108 mm (4.25"). ZT230 Industrial Printer, TT, ZPL, 203Dpi, RS232, USB, Parallel, 128MB Flash. ZT230 Industrial Printer. The easy tool-less platen and print head removal makes it easy for operators to maintain the printer. Product Model: PX4i. Product Family: EasyCoder PX. Product Line: EasyCoder. Product Type: Thermal Transfer Printer. Maximum Mono Print Speed: 304.80 mm/s. Maximum Print Resolution: 300 dpi. Label Core Size: 76.20 mm. Form Factor: Desktop. Manufacturer: Toshiba. 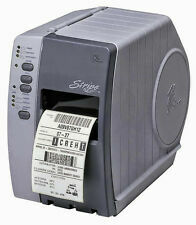 Product Type: Direct Thermal/Thermal Transfer Printer. Maximum Mono Print Speed: 304.80 mm/s. Maximum Print Resolution: 300 dpi. Product Type: Direct Thermal/Thermal Transfe. PM43, FT, ROW, Ethernet, Hanger, Batch, 300DPI, Thermal Transfer, EU cord. Certification RoHS, CE, FCC A, UL/cUL, C-Tick, D Mark, CCC. Ending Soon. Print technology Thermal transfer. And with comprehensive command language support – including ZSim2, our fast, friendly and complete ZPL-II emulation – upgrading to PM series has never been simpler. Bixolon SLP-TX423 Thermal Transfer Label Printer. SLP-TX423E/BEG - Serial/USB/Ethernet (Light Grey). Direct thermal / thermal transfer. Up to 178mm per second print speed. Label printing on paper of between 0.06 - 0.20mm thick. Tired of complicated labelers?. Prints labels from 6 mm (¼”) up to 24 mm (1”) wide in a full range of UL-rated materials and colors. PC connectivity and DYMO ID software for importing Microsoft® Excel® or database files for printing entire label batches. TLP 2824 Plus Ethernet, USB, STD. It includes a 32-bit RISC processor for faster formatting and first label out, an auto-sensing serial port, and co-resident EPL and ZPL programming languages. Maximum resolution 203 x 203 DPI. Manufacturer Part Number: G32433M. Product Model: G32433M. Product Type: Printhead. Get the best performance from your Zebra printer by usingQualityZebra supplies are made by Zebra, for Zebra printers, to the highest standards. Manufacturer Part Number: 1000843. Manufacturer: Citizen Micro HumanTech. Product Family: CL. Product Series: CL. Product Type: Direct Thermal/Thermal Transfer Printer. Maximum Mono Print Speed: 254 mm/s. Product Model: ZT410. Keep your critical operations running efficiently with Zebra's durable ZT400 Series printers,designed for years of performance in a wide array of applications. And, they include standard USB, Serial, Ethernet and Bluetooth� capabilities. ZT230 Industrial Printer, TT, ZPL, 203Dpi, RS232, USB, Peel – a front-mount, passive-peel with no take-up spindle, 128MB Flash. ZT230 Industrial Printer. The easy tool-less platen and print head removal makes it easy for operators to maintain the printer.